even the goals went two by two! Friday night’s, ‘match-of-the-season’ between arch rivals Byron Bay and Lismore Workers was played in a deluge of biblical proportions! The skies opened just before kick-off and the downpour continued until the game was finally abandoned with just a few minutes on the clock. Both teams played their hearts out in appalling conditions. Byron opened the scoring when Layton Barton was brought down in the box and Nolan Pierce put the resulting penalty neatly away. Workers fought back to equalise only to have Sam Robson tap in a rebound that took Byron ahead to 2-1. 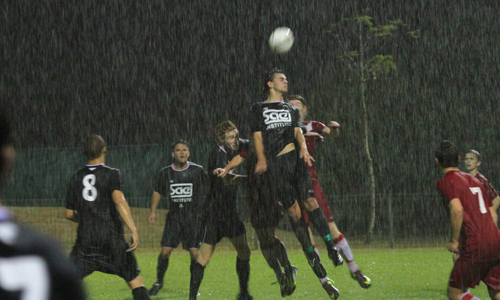 Workers again found an equaliser and despite repeated attacks by the sodden Byron squad, the score remained at 2 all. Both teams are undefeated with two draws a piece so, barring upsets, this year’s Championship could well be decided on goal difference. Workers demolition of Rovers and South Lismore in the early rounds leaves Byron with a big margin to chase and, with tough opposition in the remaining matches, every goal will be critical. Byron hosts Lennox Head at the Rec Ground this Friday at 6.30 in what promises to be another evening of entertaining football.